05/21/18 Ford motor company (ford) is recalling certain 2013 ford mustang vehicles sold, or ever registered in the states of alabama, california, florida, georgia, hawaii, louisiana, mississippi, south carolina, texas, puerto rico, american samoa, guam, the northern mariana islands (saipan), and the u.s. virgin islands or "zone a." additionally, ford is recalling certain 2010 ford edge, fusion, mustang and ranger, lincoln mkx and zephyr/mkz, and mercury milan vehicles ever registered in the states of arizona, arkansas, delaware, district of columbia, illinois, indiana, kansas, kentucky, maryland, missouri, nebraska, nevada, new jersey, new mexico, north carolina, ohio, oklahoma, pennsylvania, tennessee, virginia, and west virginia or "zone b." ford is also recalling certain 2009 ford edge, fusion, mustang and ranger, lincoln mkx and zephyr/mkz, and mercury milan vehicles ever registered in the states of alaska, colorado, connecticut, idaho, iowa, maine, massachusetts, michigan, minnesota, montana, new hampshire, new york, north dakota, oregon, rhode island, south dakota, utah, vermont, washington, wisconsin, and wyoming or "zone c." these vehicles are equipped with air bag inflators assembled as part of the passenger frontal air bag modules, used as original equipment or replacement equipment (such as after a vehicle crash necessitating replacement of the original air bags), that may explode due to propellant degradation occurring after long-term exposure to high absolute humidity, temperature and temperature cycling. 02/14/18 Ford motor company (ford) is recalling certain 2012 ford fusion and mustang and lincoln zephyr and mkz vehicles originally sold, or ever registered, in alabama, california, florida, georgia, hawaii, louisiana, mississippi, south carolina, texas, puerto rico, american samoa, guam, the northern mariana islands (saipan), and the u.s. virgin islands, or "zone a." additionally, unless included in "zone a" above, ford is recalling certain 2009 ford ranger, edge, fusion and mustang, lincoln mkx, mkz and zephyr and mercury milan vehicles originally sold, or ever registered, in arizona, arkansas, delaware, district of columbia, illinois, indiana, kansas, kentucky, maryland, missouri, nebraska, nevada, new jersey, new mexico, north carolina, ohio, oklahoma, pennsylvania, tennessee, virginia and west virginia, or "zone b." additionally, unless included in "zone a" or "zone b" above, ford is recalling certain 2007-2008 ford ranger, edge and lincoln mkx, 2006-2008 ford fusion, mercury milan, lincoln zephyr and mkz, 2005-2008 ford mustang and 2005-2006 ford gt vehicles originally sold, or ever registered, in the states of alaska, colorado, connecticut, idaho, iowa, maine, massachusetts, michigan, minnesota, montana, new hampshire, new york, north dakota, oregon, rhode island, south dakota, utah, vermont, washington, wisconsin and wyoming. these vehicles are equipped with certain air bag inflators assembled as part of the passenger frontal air bag modules used as original equipment or replacement equipment. in the event of a crash necessitating deployment of the passenger frontal air bag, these inflators may rupture due to propellant degradation occurring after long-term exposure to absolute humidity and temperature cycling. 02/02/18 Ford motor company (ford) is recalling certain model year 2007-2011 ford ranger vehicles, 2006-2011 ford fusion, mercury milan and lincoln zephyr/mkz vehicles, 2007-2010 ford edge, lincoln mkx vehicles, 2005-2006 ford gt vehicles, and 2005-2011 ford mustang vehicles originally sold, or ever registered, in alabama, california, florida, georgia, hawaii, louisiana, mississippi, south carolina, texas, puerto rico, american samoa, guam, the northern mariana islands (saipan), and the u.s. virgin islands, or "zone a." additionally, unless included in "zone a" above, ford is recalling certain model year 2007-2008 ford ranger, edge and lincoln mkx vehicles, 2006-2008 ford fusion, mercury milan and lincoln zephyr/mkz vehicles, 2005-2006 ford gt vehicles and 2005-2008 ford mustang vehicles originally sold, or ever registered, in arizona, arkansas, delaware, district of columbia, illinois, indiana, kansas, kentucky, maryland, missouri, nebraska, nevada, new jersey, new mexico, north carolina, ohio, oklahoma, pennsylvania, tennessee, virginia, and west virginia, or "zone b." any vehicle not included in "zone a", or "zone b" is not included in the safety recall. these vehicles are equipped with certain air bag inflators assembled as part of the passenger frontal air bag modules, and used as original equipment or replacement equipment. in the event of a crash necessitating deployment of the front air bags, these inflators may rupture due to propellant degradation occurring after long-term exposure to absolute humidity and temperature cycling. 08/25/17 Ford motor company (ford) is recalling certain 2017 lincoln mkz and ford edge and fusion vehicles. on vehicles with 2.0l gas engines and six-speed automatic transmissions, the torque converter weld studs may have been inadequately welded. 10/19/15 Engine Ford motor company (ford) is recalling certain model year 2016 ford fusion vehicles manufactured september 3, 2015, to september 13, 2015, and 2016 lincoln mkz vehicles manufactured september 3, 2015, to september 12, 2015. the affected vehicles have a fuel tank that may have insufficent wall thickness. as a result, the fuel tanks may crack in the event of a crash and thus the vehicles fail to comply with the requirements of federal motor vehicle safety standard (fmvss) number 301, "fuel system integrity." 01/09/14 Transmission and Drivetrain Ford motor company (ford) is recalling certain model year 2013-2014 lincoln mkz hybrid vehicles manufactured april 26, 2012, through september 24, 2013. due to a manufacturing error, the transmission range sensor may not function properly allowing the affected vehicles to be shifted out of the park position without first applying the brake pedal. thus, these vehicles fail to conform with the requirements of federal motor vehicle safety standard (fmvss) no. 114, "theft protection." 04/30/18 Suspension and Steering Ford motor company (ford) is recalling certain 2014-2018 lincoln mkz and ford fusion vehicles. the steering wheel retaining bolt may loosen allowing the steering wheel to detach while driving. 07/21/15 Suspension and Steering Ford motor company (ford) is recalling certain model year 2011-2012 ford fusion vehicles without a 3.5l engine and lincoln mkz hybrid electric vehicles, 2011 mercury milan vehicles, 2011-2012 ford taurus, ford flex, lincoln mks, and lincoln mkt vehicles equipped with a 3.5l gtdi engine and 2013 ford taurus, ford flex, lincoln mks, and lincoln mkt vehicles equipped with any available engine. the affected vehicles have electric power steering assist systems that may shut down as a result of a steering motor sensor fault. 06/24/15 Suspension and Steering Ford motor company (ford) is recalling certain model year 2013-2015 ford fusion and lincoln mkz vehicles manufactured february 3, 2012, to march 20, 2015, and 2015 ford edge vehicles manufactured february 26, 2015, to february 28, 2015, and originally sold, or currently registered in, connecticut, delaware, illinois, indiana, iowa, maine, maryland, massachusetts, michigan, minnesota, missouri, new hampshire, new jersey, new york, ohio, pennsylvania, rhode island, vermont, west virginia, wisconsin and the district of columbia. in the affected vehicles, snow or water containing road salt or other contaminants may corrode the electric power steering gear motor attachment bolts. 05/26/15 Electrical and Air Conditioning Ford motor company (ford) is recalling certain model year 2013-2014 ford c-max vehicles manufactured january 19, 2012, to november 21, 2013; ford fusion vehicles manufactured february 3, 2012, to august 24, 2013; ford escape vehicles manufactured october 5, 2011, to november 1, 2013; and lincoln mkz vehicles manufactured april 25, 2012, to september 30, 2013. the coating on portions of the restraint control module (rcm) may crack, and when exposed to humidity, circuits on the printed circuit board may short. 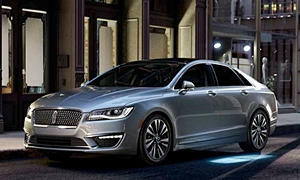 05/08/15 Electrical and Air Conditioning Ford motor company (ford) is recalling certain model year 2015 lincoln mkz vehicles manufactured february 17, 2014, to march 19, 2015, and equipped with daytime running lights (drl). in the affected vehicles, the parking lights do not reduce their light output from a drl level when used in conjunction with the headlights. as such, the light output may exceed the the permissable amount allowed by federal motor vehicle safety standard (fmvss) number 108, "lamps, reflective devices, and associated equipment." 06/28/13 Electrical and Air Conditioning Ford is recalling certain model year 2013 lincoln mkz vehicles manufactured april 25, 2012, through march 15, 2013 and equipped with an engine block heater. during use, the engine block heater cords may be bent and in certain temperatures, the wire insulation may crack, exposing the electrical wires. 05/16/17 Other Ford motor company (ford) is recalling certain model year 2013-2016 ford fusion vehicles manufactured november 2, 2012, to july 31, 2014, and 2013-2015 lincoln mkz vehicles manufactured november 14, 2012, to july 31, 2014. in the event of a crash, heat from the deployment of a seat belt pretensioner may cause a front seat belt anchor cable to fail. 05/26/15 Other Ford motor company (ford) is recalling certain model year 2013-2014 ford c-max vehicles manufactured january 19, 2012, to november 21, 2013; ford fusion vehicles manufactured february 3, 2012, to august 24, 2013; ford escape vehicles manufactured october 5, 2011, to november 1, 2013; and lincoln mkz vehicles manufactured april 25, 2012, to september 30, 2013. the coating on portions of the restraint control module (rcm) may crack, and when exposed to humidity, circuits on the printed circuit board may short. 07/26/14 Other Ford motor company (ford) is recalling certain all weather driver side accessory floor mats sold for use in model year 2006-2011 ford fusion and mercury milan, 2006 lincoln zephyr, and 2007-2011 lincoln mkz vehicles manufactured november 9, 2007, through october 31, 2010. the affected floor mats may move and possibly interfere with the accelerator pedal. 05/30/14 Other Ford motor company (ford) is recalling certain model year 2013-2014 ford fusion and lincoln mkz vehicles manufactured august 15, 2012, through september 10, 2013, 2013-2014 ford escape vehicles manufactured june 5, 2012, through august 12, 2013, and 2013-2014 ford c-max vehicles manufactured from july 23, 2012, through may 28, 2013. the driver and passenger seatback assemblies may have been produced with sub-standard weld joints used to attach the seat back recliner mechanism to the seat frame. the affected seat backs may have insufficient strength to meet the requirements of federal motor vehicle safety standard (fmvss) number 207, "seating systems."